Welcome to March Madness. You see this phrase everywhere these days, and for good reason. Now that the calendar has turned to March, this begins perhaps the most exciting month of the entire year. College basketball fans all across the country revel in the fact that there is wall-to-wall hoops action for virtually the entire month, and another phrase "get your brackets ready" will soon be uttered as well. 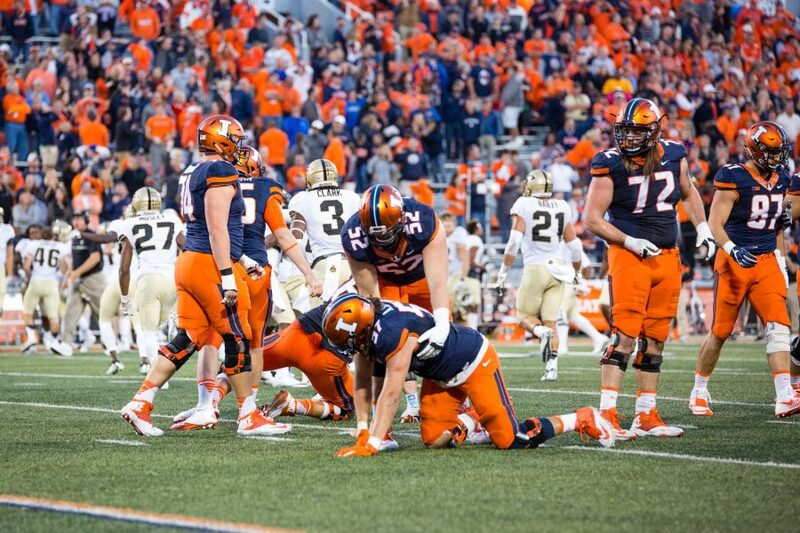 The Fighting Illini have had a roller coaster of a season, starting out the season very well, then having a lull in the middle of the season that saw them start out the Big Ten season a dismal 2-7. However, the Illini turned the season around when it counted, and since their huge win against Indiana last month, have been playing much better, although it hasn't been showing up on the scoreboard at all times. Illinois finished up the regular season on Sunday afternoon, dropping a 68-55 decision to the Ohio State Buckeyes at Value City Arena in Columbus to finish the regular season 21-11 and 8-10 in the Big Ten Conference. One might look at that league record and think it wasn't that good, but at the beginning of the season, I think everyone would have taken that. Sure, there were games that the Illini lost that they shouldn't have, but this season in the Big Ten, was anything but easy. The league was very competitive this season, and with all of the teams in the Top 25 of the country for the entire year, every night was an adventure. This week's Big Ten Tournament promises to be one of the deepest in recent memory, and who knows what will happen when the four day event is over on Selection Sunday. The tourney returns to Chicago's United Center for the first time since the 2006-07 season beginning on Thursday, and it is anybody's guess as to how it will go. Here is a quick synopsis of all 12 teams in the conference, and their seed in the tourney. #1 Indiana (26-5, 14-4) - By far the best team top to bottom in the Big Ten this season, the Hoosiers are extremely lucky that they are regular season champs all by themselves, and they have a disastrous collapse by Michigan in the last minute of play to thank for that. Indiana is led by their center Cody Zeller and strong forwards Victor Oladipo and Christian Watford, and have some momentum going into the weekend. However, their championship was marred a little bit by the antics of head coach Tom Crean, who exchanged words with Michigan assistant coach Jeff Meyer after the game. It's not the first time that Crean has exhibited this activity, and judging by who his brothers-in-law are, it's not a total surprise and I am fairly confident that it won't be the last time. #2 Ohio State (23-7, 13-5) - Coach Thad Matta has been up near the top of the Big Ten standings for the past four years, and this season was no exception, as they rode the shirttails of guard Aaron Craft and forward Deshaun Thomas. One would have thought that losing a player the caliber of Jared Sullinger would have brought the Buckeyes back down to the middle of the pack, but one would be wrong. Matta somehow had his guys regroup and once again challenge for the title. They almost pulled it off. #3 Michigan State (24-7, 13-5) - Talk about your success stories. Spartans coach Tom Izzo has been doing this for a long time, and he knows how to get his team in position for the postseason. Michigan State is once again right up there at the top of the conference standings, and will have a bye into the quarterfinal round, a trend that has been the norm rather than the exception. Even though Draymond Green took his talents to the NBA at the end of last season, the emergence of Derrick Nix and continued quality play of Keith Appling have once again propelled the Spartans into position to challenge for yet another Big Ten Tournament title. #4 Wisconsin (21-10, 12-6) - There are few things in this world that are guaranteed. Among them, however, is that no matter what kind of a team Bo Ryan puts on the floor, that they will be successful. The same holds true this season and Ryan has taken a bunch of unproven players and made them into a squad that grabbed the final first round bye in the tourney. Led by Jared Berggren and sharpshooting freshman guard Sam Dekker, the Badgers were a pleasant surprise in the Big Ten this season and with any luck, will continue that surprise run to a possible fantastic finish. #5 Michigan (25-6, 12-6) - Talk about a troubling end to an otherwise great season. All Michigan had to do to gain a share of the conference title was beat Indiana in the final game of the season. It looked as if that was going to happen until the Wolverines began to miss free throws, and, ultimately, threw away the game and what turned out to be a top four seed in the tourney. Michigan must now play on the opening day of the conference tournament, and will face Penn State, a team that beat them just a couple weeks ago. Michigan is still loaded with talent, as player of the year Trey Burke will hopefully lead the Wolverines to win the tournament by winning four games in as many days. #6 Iowa (20-11, 9-9) - The Hawkeyes are a prime example of a team that stayed steady during the regular season, took care of business on their home floor, and managed to do well enough to just narrowly miss an opportunity for a first round bye in the tourney. Roy Devyn Marble still remains one of the better players on this team, but Aaron White and Adam Woodbury certainly factored into Iowa's success this season. Coach Fran McCaffrey may not have finished in the top 5 of the conference standings, but the future bodes well for he and his program, and the thought of a top tier finish is not out of the ordinary in the near future. #7 Purdue (15-16, 8-10) - How do you ask that the Boilermakers received a higher Big Ten Tournament seed than Minnesota and Illinois when they tied with them in the standings, yet have a worse overall record? The answer is easy. Welcome to the Big Ten. Purdue had a better head to head record against the other teams in the league, and that is why they received the higher seed. Coach Matt Painter lost quite a bit last season, and it was not a surprise that the Boilermakers struggled at times this year. An early win against Illinois in West Lafayette proved that Purdue could play with the best of the best, and led by guards D. J. Byrd and Anthony Johnson, the Boilermakers did just enough to wrest away the #7 seed from the likes of the Illini and the Gophers. Freshman A. J. Hammons had a good first season as well, which certainly didn't hurt matters any. #8 Illinois (21-11, 8-10) - As has been previously mentioned, the Illini had a roller coaster of a season, starting out 12-0, and then stumbling out of the gate in the Big Ten to start the conference season 2-7 before making a strong late season run to finish at 8-10. First year coach John Groce was left with a decent stable of talent from former coach Bruce Weber, and Brandon Paul, D. J. Richardson and Tyler Griffey made the most of their senior year and have the Illini poised to return to the NCAA Tournament after missing the field several times over the past few seasons. #9 Minnesota (20-11, 8-10) - The Golden Gophers are another team that have had their ups and downs this season. Minnesota started off as one of the top 10 teams in the country, came into Champaign early in the season and beat the Illini, and were looking like they were one of the top teams to beat in the Big Ten. But, the Gophers fell on hard times due to an injury to Rodney Williams, and as a result, have fallen back down to earth and will enter the Big Ten Tournament as the #9 seed opposite Illinois. Each team won on the other's floor, so on a neutral court, anything goes. Minnesota relies on their go-to guy Austin Hollins and big man inside Trevor Mbakwe, but the bigger story here may be coach Tubby Smith, who may be coaching for his job. Stay tuned. #10 Nebraska (14-17, 5-13) - Nebraska, the newcomer (for now) to the league, is still dealing with some growing pains, and the fact that they had their first four games against the top 4 teams in the league to start the season didn't help much. New coach Tim Miles, a great addition to the Big Ten, has the Cornhuskers heading in the right direction, and with a little talent added in Lincoln, they can begin their ascent up the Big Ten standings. Nebraska relies on their star player Brandon Ubel, and Miles only plays about 7 guys in most games so depth is a serious issue. The Cornhuskers will battle Purdue on Thursday, with the winner getting the right to face #2 Ohio State in the quarterfinals on Friday. #11 Northwestern (13-18, 4-14) - Don't blame Wildcats coach Bill Carmody if he feels that he cannot catch a break. Northwestern was finally in position to challenge for their first ever NCAA Tournament bid this year, but a series of unfortunate events decided otherwise for "Chicago's Big Ten Team". First, Drew Crawford was lost with a season ending injury, and then JerShon Cobb was an academic casualty, which set them back quite a ways. The Wildcats came into Champaign and beat the Illini earlier in the season, a game in which the Illini played quite possibly their worst game of the season, and the hero of that game, transfer from Louisville Jared Swopshire, had a monster game. Swopshire later was lost with an injury as well, and the rest pretty much speaks for itself. At this point, it is hard to fathom how Carmody will keep his job after all of this, but if he does, I guess he has a valid reason for the lack of success this year. #12 Penn State (10-20, 2-16) - Not much good has come out of Happy Valley this year, dating back last year to all of the news surrounding the football program and the ultimate death of Joe Paterno as a result. To add insult to injury, the Nittany Lions started off the Big Ten season with 13 straight losses, before upsetting Michigan at the Bryce-Jordan Center to gain their first conference win of the season. The season probably wrote its own script early on when Penn State's best player and preseason player of the year candidate Tim Frazier was lost for the season. Head coach Patrick Chambers, himself one of the more fiery coaches in the league, did the best with what he had, and led by D. J. Newbill, found a way to win 2 games in the league. That still gave them the bottom seed in the tournament opposite Michigan, who no doubt will be looking for revenge from that earlier loss. Time to lace 'em up and play some ball. I'm ready, are you? The Fighting Illini women saw their Big Ten Tournament run end prematurely last Thursday, as they were defeated 58-57 by Wisconsin in the opening round at the Sears Centre in Hoffman Estates. Illinois, who needed to win at least one game in the tournament to be considered as an at-large entrant in the NCAA Tournament, probably are on the outside looking in now, as their record stands at 16-12. Karisma Penn, who has been the mainstay of the Illini this season, was plagued with foul trouble and only scored 8 points. Ivory Crawford led the Illini in scoring with 14 points, while Amber Moore and Adrienne GodBold added 13 and 12 points, respectively. Even though it seems that the Illini will not be dancing with the big kids this season, new coach Matt Bollant definitely has the program heading in the right direction. Not sure what is going on with the Illinois football team and its hiring of coaches, but yet another one has flown the coop after merely a month on the job. Jim Bridge, who came to Illinois from North Carolina State, lasted just 41 days and has taken the same position, which is offensive line coach, at conference rival Purdue. To fill the staff vacancy, head coach Tim Beckman has added A. J. Ricker, who came from Middle Tennessee State. Ricker had previously coached at Western Michigan, where he was the offensive line coach/run game coordinator under coach Bill Cubit, who is now the offensive coordinator at Illinois. Let's hope Ricker stays a while. Happy 50th Birthday Assembly Hall!! This weekend's Illini basketball game will be a big event on many levels. First of all, the Assembly Hall turns 50 on Saturday, and as important, it is the annual Senior Day that will see the final game be played for three mainstays, one transfer, and a seldomly used walk-on. But more on that later. The Assembly Hall has seen many different events in the history of its existence, and as a child, I remember seeing Barnum and Bailey's Circus in there and wondering how neat the place looked, seemingly looking like a spaceship in the middle of a campus. Over the course of its time, it has seen many Illini basketball games, and who could forget Eddie Johnson's shot to defeat Michigan State (1979), Andy Kaufman's last second shot to defeat Iowa (1993), or during the magical season of 2004-05, the night that the Illini knocked off Wake Forest to rise to #1 in the nation, a lofty perch they would remain at for nearly the entire season. (Sorry Indiana, you have had 3 chances this season to hold the top spot, and you have blown them all). Of course, Brandon Paul's 43 points to take down Ohio State last season also stands out, as well as a couple weeks ago when the Illini knocked off #1 Indiana to subsequently save their season. The building is set to undergo a massive renovation after next year's basketball season, and early graphics that I have seen will make the interior look a whole lot different. However, the exterior will look much the same as it has over the past 50 years. One of the main tenants of the Assembly Hall over these past 50 years are the various basketball teams of the Fighting Illini. On Saturday, the Illini ( will take the court for the final time in the 2012-13 season (vs. Nebraska. 4:15 pm CT, BTN), and with that, 5 Illini will be playing their final game on the Assembly Hall court. This group of seniors have been through a lot, seeing some success, a lot of frustration and disappointment, and endured a coaching change at the end of last season. One by one, I will briefly recognize and analyze each one of these seniors, and their value to the Illinois program through their tenure. The Illini currently are 20-9 overall and 7-8 in the Big Ten, and really could use this win against Nebraska to secure their ticket into the upcoming NCAA Tournament. D. J. Richardson - The last in a succession of players from the Peoria area, Richardson had a good freshman season, then slid downward for the next two seasons. This year, D. J. has had a resurgence, and is responsible for quite a few Illini wins. He has proven that he can still shoot from long range, and even though he has fallen out of favor with some of the Illini faithful, he still has had a pretty good career at Illinois. Brandon Paul - Brandon has had a steady career at Illinois, and has also had some monster games, most notably the aforementioned 43 point effort against Ohio State last season. Paul will go down as one of the more prolific scorers in Illini history, and probably has the best shot out of all the outgoing seniors to continue his game at the next level in the NBA. With other scorers, namely Richardson, stepping up this season, the Illini have not had to rely on Brandon as much this season. During the famous slide early this season, Paul disappeared, but has resurfaced at the right time. Tyler Griffey - Tyler has had an up and down career as an Illini, seeing a little action as a freshman, then being pressed into service as a sophomore to play a lot of minutes. As a junior, Griffey's playing time diminished once again, but when the coaching change occurred at the end of last season, he once again has seen a lot of action. Now out of the starting linuep, his confidence disappeared, thus decreasing his scoring output. Griffey may very well be remembered for slipping away from Indiana's Cody Zeller and scoring the winning layup at the buzzer to upset the top-ranked Hoosiers. Griffey is a very nice kid, and his honest and pleasant demeanor will be missed. Sam McLaurin - A fifth-year transfer from Coastal Carolina, McLaurin was brought in by John Groce to supplement the vacancy left by Meyers Leonard, who took his game to the NBA at the end of last season. McLaurin brings a presence to the inside that has been very positive, and is now in the starting lineup, or if not, one of the first players off the bench. Sam has given the Illini some quality minutes, and while not a scorer, does the job that Groce asks him to do on the boards. Kevin Berardini - A seldom used redshirt junior, Berardini has decided to go out with this class. The job of a walk-on is not glamorous, and the time that they put in at practice for as little playing time that they get may not seem worth it to most. But Kevin has kept a great attitude from it, and he transferred to Illinois at the end of his freshman year, where he played at Loyola Marymount. The Illini women's basketball team also was celebrating senior night on Thursday evening at the Assembly Hall, and this group of seniors have not had a very good career as a team, although one of those players, Karisma Penn, will go down as one of the best players in the history of the program. Penn has been a double-double machine, recording 41 of those in her Illini career, including another one against Ohio State. The Illini, unfortunately couldn't get the job done against the Buckeyes, losing 64-53, sending these seniors out on a sour note. However, this Illini team are sending the seniors off in much better shape than when they came into the program. A lot of this can be attributed to new coach Matt Bollant, who has brought a new style and energy to the program. The Illini currently sit at 16-11 overall and 9-6 in the Big Ten, their best marks in both categories in several years. Along with Penn, Adreienne GodBold also played her final game as an Illini. GodBold came to Illinois with a lot of potential, and lived up to that hype for most of her time in Champaign. However, a setback occurred early this season, when she was deemed academically ineligible and had to sit out the first part of the season. Since her return, the Illini have bounced back and are battling for their first NCAA Tournament berth in several years. A third senior, Kersten Magrum, is done at Illinois, due to sustaining several concussions over the past couple of years. Magrum also had a decent career at Illinois, but sadly, it was cut short due to the injuries. The Illini will conclude the regular season on Sunday when they travel to West Lafayette to battle the Purdue Boilermakers (3:00 pm CT, BTN), a team that they have had a lot of trouble against in the past few seasons. The women's version of the Big Ten Tournament begins next Thursday at the Sears Centre in suburban Hoffman Estates. Even though the weather outside doesn't put you in the frame of mind for football, Illini coach Tim Beckman officially begins his second season as head coach on Monday with the start of spring workouts. The coaching staff has been overhauled, and some new faces will be stepping up this year for the Illini, but don't count on it adding to wins just yet. This team will be young and inexperienced, but hopefully some of the junior college transfers coming into the program will be able to be a stopgap and at least make them relevant. What this means for the future of Beckman is too early to tell, but it cannot get much worse than ie ended last season. The annual spring game will be on Friday night, April 12th this season, a change from the Saturday afternoon that it has been on for the last few years. Some of the minor sports get overlooked in favor of the major, revenue producing sports, but these so called non-revenue sports have been among the most successful lately. A special congratulations go out to the women's indoor track and field team, who won the Big Ten Championship last weekend. Coach Tonja Buford-Bailey, herself a standout athlete at Illinois, has really done a great job with this team, and is now reaping the rewards of that teaching. Ashley Spencer, who had a great freshman year on the track for the Illini, is continuing that trend as a sophomore, and helped the Illini get their first conference title since 1996.